As we continue to make posts of the cities of the seven churches of Asia (Rev. 2-3), we now come to the city of Sardis. 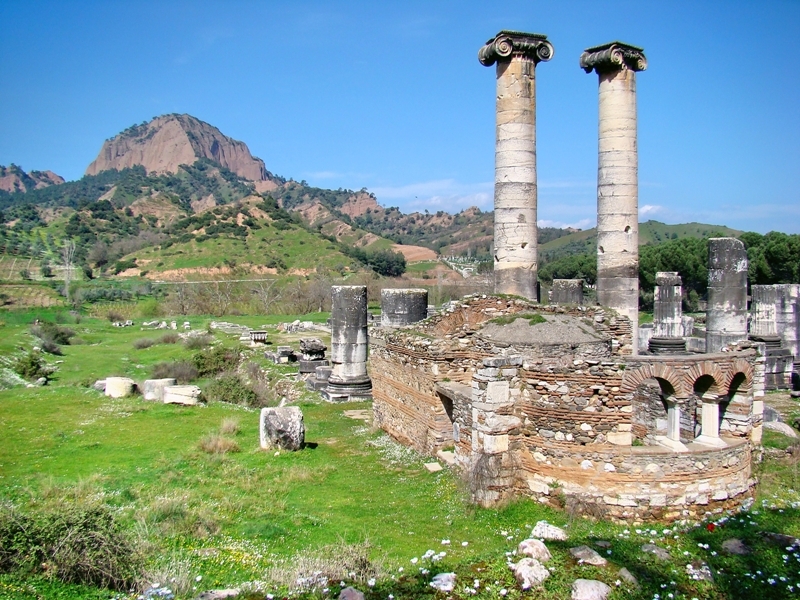 The city of Sardis was located on the river Pactolus, at the foot of mount Tmolus. The modern name is Sart. 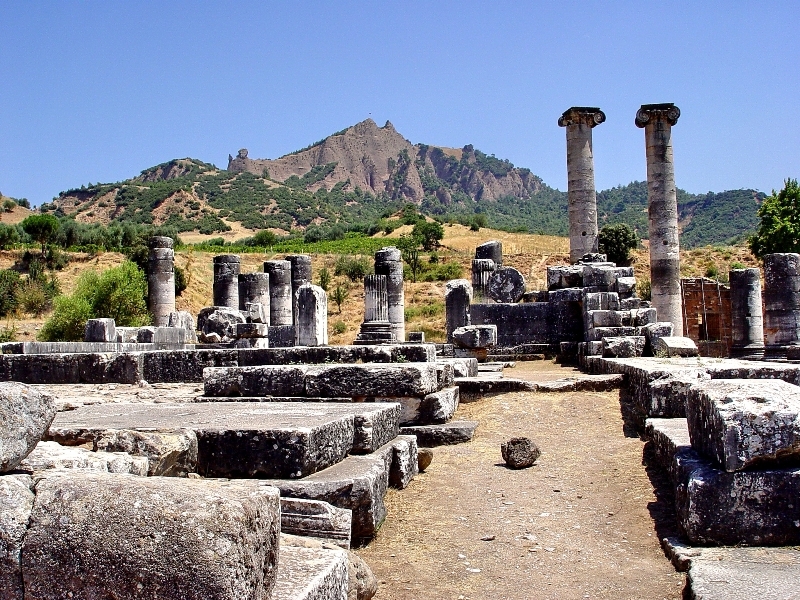 Sardis was formerly the capital of the ancient Lydian Kingdom and was one of the greatest cities of the ancient world. It was here at Sardis that coined money was invented. Twice in the city’s history it had fallen into the hands of its enemies because the people of Sardis failed to “watch” (once to the Persians, 546 B.C., and later to the Selucids (215 B.C.). The church at Sardis addressed in Rev. 3 had failed to be as watchful as they should. Jesus said, “You have a reputation that you are alive, but in reality you are dead” (Rev.3:1, NET). They had a good name, but their true character did not match their reputation. They needed to change that. 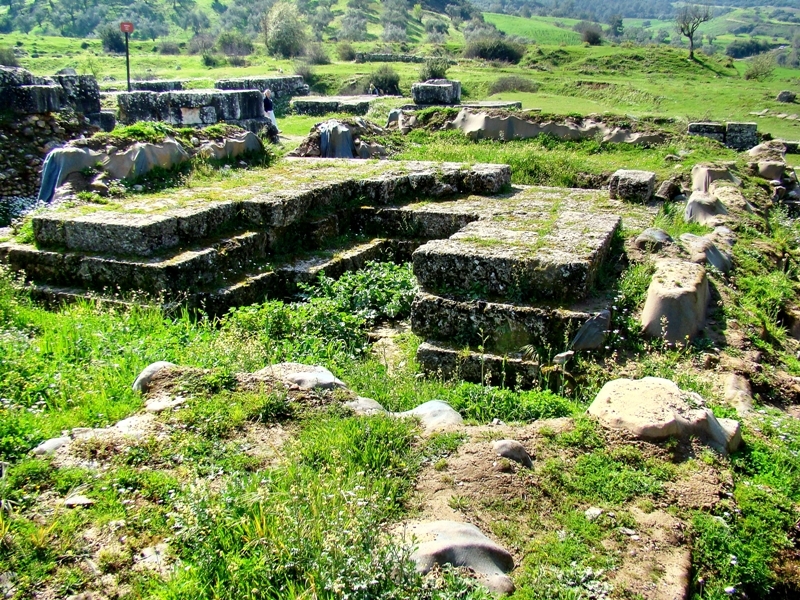 The city of Sardis was a center for the worship of the goddess Artemis. The ruins of the temple were excavated by Howard C. Butler in the years 1910-1914. In our photo below you can see the ruins of the temple, and in the distance the city’s acropolis, on the edge of the Tmolus range. The history of this temple goes back to the 5th century B.C. Over time, additions were made to the site. On the lower portion of the grounds you can see the ruins of the Roman altar. See our photo below. Sardis. Roman Altar at temple of Artemis. Photo ©Leon Mauldin. Our photo below shows the site with Tmolus to our back. The brown brick building at right foreground is a church building constructed about the 5th century A.D.
Sardis. Artemis Temple and 5th century A.D. Church. Photo ©Leon Mauldin. Remember to click on images for higher resolution. More to come on Sardis! This entry was posted on Monday, May 31st, 2010 at 10:23 PM and is filed under Archaeology, Bible History and Geography, Bible Places. You can follow any responses to this entry through the RSS 2.0 feed. You can leave a response, or trackback from your own site.